This revolutionary system has simplified the process of changing oil on lawn tractors, providing a hassle-free maintenance experience. The John Deere Easy Change™ 30-Second Oil Change System has officially been recognized with a 2018 Best of What’s New Award from Popular Science magazine. This annual competition is meant to highlight products and technology that represent a “significant step forward” in 10 categories, ranging from home to automotive. 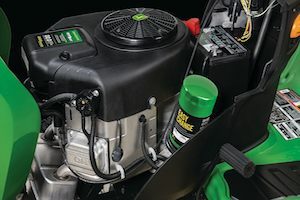 Introduced in February 2018, the John Deere Easy Change™ 30-Second Oil Change System was designed with the purpose of making it simple to change the engine oil on lawn tractors from Deere. With this system in place, owners of the E120, E130, E150, E160, E170, and E180 models can easily change their oil by twisting on a new cartridge; there is no need to drain the oil. By changing the filter, Deere mower owners can remove captured contaminants and replace about 0.76 liters of the engine oil. Compared to the 100 Series oil system, the Easy Change system runs 22 degrees Fahrenheit cooler, increases filtering capacity, and eliminates oil change spills. To learn more about the John Deere Easy Change 30-Second Oil Change System or other John Deere equipment, please visit www.JohnDeere.com or your local John Deere dealer.